One of my favorite bands, Deas Vail, has a creative new video that just came out. The song, "Summer Forgets Me," is a bittersweet tune from their forthcoming third album. Summer Forgets Me - Deas Vail (Official Video) from Mono Vs Stereo on Vimeo. And I've read quite a few. 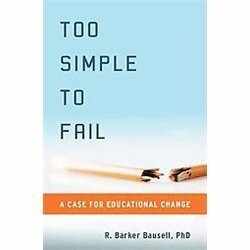 The book is Barker Bausell's "Too Simple to Fail: A Case for Educational Change", which just came out from Oxford University Press. Bausell was a biostatistician and professor for many years at the University of Maryland, but he started out in graduate school doing some fascinating educational experiments that showed the irrelevance of teacher training. He brings the perspective of a brilliant outsider. All school learning is explained in terms of the amount of relevant instructional time provided to a student. That's it: more time + suitability for a child's level. This may seem too simplistic at first glance, but Bausell marshalls evidence that his theory explains, well, a lot. Possibly even the achievement gap. Studies of home behavior have shown that middle-class families spend much more time talking and reading to their children at a high level. This is the most elegant explanation for why those children do better in school -- they have had much more time devoted to their learning. Consider too the success of KIPP schools. This is almost surely because KIPP has kids spend much more time in class. And reducing class size works for many kids (all else being equal, which isn't always true), because teachers are able to 1) keep classroom discipline better, and/or 2) give more personal attention, both of which boil down to kids having more time being instructed at their own level. Thirty years ago two studies measured the amount of time teachers spent presenting instruction that matched the prescribed curriculum, at a level students could understand based on previous instruction. The studies found that some teachers were able to deliver as much as 14 more weeks a year of relevant instruction than their less efficient peers. There was no secret to their success: the efficient teachers hewed closely to the curriculum, maintained strict discipline and minimized non-instructional activities, like conducting unessential classroom business when they should have been focused on the curriculum. And both studies found that the teachers who taught more were also the teachers who produced students who performed well on standardized tests. So spending more classroom time actually teaching helped the kids learn more. Common sense, really, but common sense often gets lost in the heat of education debates. In the book, he describes a fascinating study he did early in his career: designing an elementary math lesson based on a few number theory topics and a test based on the lesson, and then having 15 accredited teachers and 15 undergraduates teach the same lessons for a week to children. It turned out that "there was absolutely no difference . . . between the amount the children learned in the 15 classrooms taught by experienced elementary school teachers and the amount the children learned in the 15 classrooms taught by inexperienced untrained undergraduates" (p. 29). As long as kids were taught the material for the same amount of time, it didn't matter who was doing the teaching. Bausell also has a provocative chapter ripping apart the entire industry of standardized tests. He contends that there should be no such thing as tests that aren't matched perfectly to the curriculum. That is, if time is being spent teaching a certain curriculum, then any test should be based on that curriculum and nothing else. Whenever tests include anything outside of the curriculum (let's say, a reading passage about snowboarding, as was the case on one recent Arkansas test), they end up measuring something other than what was learned in school -- such as a student's experience with snowboarding. You: I'm glad to know that I have more money than the average person in the country, but what I'd like to know is what my balance is. You see, I have a more pressing concern. What I need to know is how much money I have in my account because I want to buy a mattress. Help Center: I'm sorry, but we don't keep records in that manner. We can provide you with an age-equivalent financial score, and we can predict what that score will be upon your retirement. We can even predict what your percentile rank is in terms of property and stocks, based upon your account. If I may be allowed to put you on hold for 45 seconds, I will provide you with all this information. You: But I need to know how much money I have in my account. I don't need to know all of this other information. . . .
Now as absurd as this conversation may sound, this is the only type of information that a standardized test is capable of providing. And what does it profit you (or a teacher for that matter) to know how well your child stacked up against other third-graders from Washington State or Florida . . . ? For one thing, even this odd level of information can be quite misleading if our public schools as a whole are drastically underperforming -- which they are. Wouldn't it make more sense to you and your daughter's teacher to know what percentage of the curriculum she had mastered? Even better, to inform the two of you exactly what your daughter hadn't yet learned and how much additional instructional time would be required for her to correct this deficit? (pp. 133-34). What are his policy prescriptions? Here are most of them; they're all geared towards increasing the amount of relevant instructional time delivered to each child. 1. Pre-K, using direct instruction rather than constructivist principles (for which Bausell has contempt). 2. Increase the length of the school day, and devote the entire day to relevant instruction (not 'candy sales, worthless school assemblies, loudspeaker announcements, sports activities, ad nauseam"). 3. Increase the length of the school year. 4. No tolerance for any behavior that prevents or distracts students from learning. ("If this means that we have to leave certain children behind because they can't meet behavioral expectations (or we don't know how to enable them to conform), so be it. . . . Schools exist to teach, not to be law enforcement agencies."). 5. The entire curriculum should be exhaustive and detailed, and computerized tests should be based exclusively on the curriculum. 6. Grades and classrooms should be largely irrelevant, because students should each be learning material at their own level, whatever that happens to be. 7. Teacher behavior should be "monitored constantly to ensure the delivery of sufficient instruction, as well as satisfactory coverage of (and minimal departures from) the established curriculum." Bausell adds that the view of the teacher as an autonomous professional is "woefully outdated. Professions such as medicine have largely abandoned this intuition-laced mode of operation for a more evidence-based approach accompanied by practice guidelines. Thoracic surgeons, for example, perform the vast majority of their professional tasks according to rigidly prescribed protocols. Of course, they also don't have tenure, and they can be sued if their outcomes are substandard, following divergence from these protocols." 9. Find lots of free tutors from the ranks of parents, older students, retired persons, or welfare recipients. A high school diploma "isn't required to give children (a) practice reading sight words or (b) learning simple mathematical operations via a set of flash cards." All in all, a great and thought-provoking read. Highly recommended. 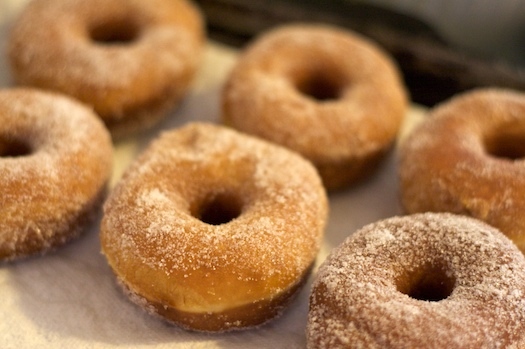 No one recommends starting every day with a doughnut, but it's better to eat a sugary snack than to fast until lunch, says dietitian Karen Ansel, spokesperson for the American Dietetic Association. "A doughnut provides enough glucose to switch your body into gear -- at least for an hour or two, before your blood sugar plummets again." 3) In fact, as highly processed carbohydrates with a high glycemic load, doughnuts are far worse for your heart than meat, eggs, and milk (see also this). 4) Occasional fasting is affirmatively good for you in many ways.